Newcastle’s Carnegie library, foreground, stands right next door to the historic Weston County Courthouse. Photo courtesy of WyoHistory.org. Begin your historic outing at the Anna Miller Museum. Once a stable for Calvary horses, the building was constructed between 1933 and 1936 of native sandstone quarried east of Newcastle. In 1966 the historic barn became home to the community museum. Several historic buildings, including the Green Mountain School (a one-room schoolhouse) and the Jenney Stockade Cabin, are on display near the museum. The beautiful downtown area took root with the 1880s arrival of the railroad. Historians, and those with an appreciation for architecture, are sure to enjoy a walk through the downtown. Begin your walk at the Weston County Courthouse, listed on the National Historic Register and located at the east end of the downtown area. The courthouse, built in 1908, still serves as home to the county offices. The United States Post Office, also on the National Historic Register, is directly across the street. 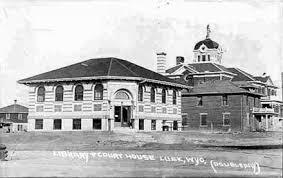 Adjacent to the courthouse stands the Carnegie Library, opened in August 1912. A group of local women, with support from then Senator Mondell, worked tirelessly to ensure the library became a reality. Northeast Wyoming was one of the last areas settled by homesteaders during western expansion. Newcastle was known for getting “a little bit western” during those early years. A sign telling the story of the hanging of Diamond L. Slim, located at 301 Main, stands in memory of those wilder days when the local citizens sometimes took justice into their own hands. Slim had confessed to murder and the local population took it upon themselves to carry out his sentence. “Walk About Town,” a guide to Newcastle’s historic attractions, is available at the local Visitor Center, 1323 Washington Blvd. 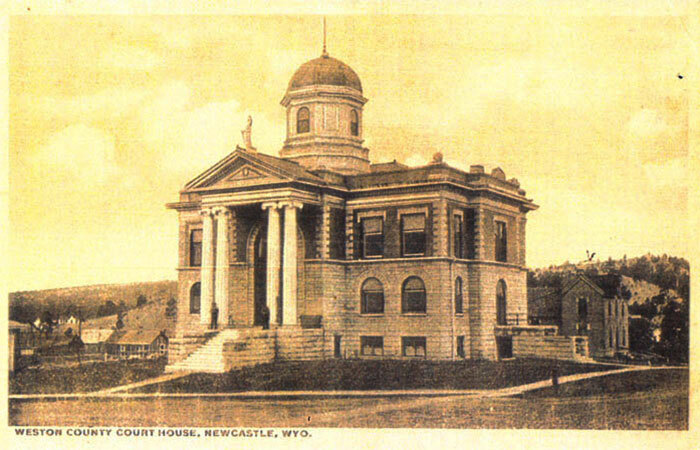 The Weston County Courthouse is the centerpiece of downtown Newcastle and has been since 1908. President Taft once gave a speech from the building’s steps.